Education Graduate Students’ Association (EGSA) / Association d’étudiant.e.s diplomé.e.s d’éducation (AÉDÉ) presents: Tech Talks by Rebecca. 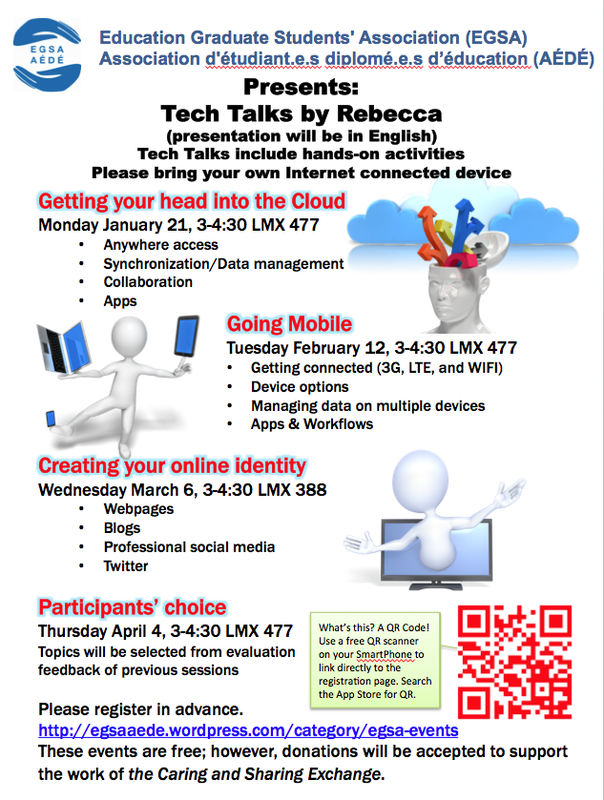 EGSA Tech Talks by Rebecca are 90 minute talks on technology that include hands-on activities. To participate fully in the workshops, please bring your own internet connected device (laptop, tablet, SmartPhone, etc). The presentation will be in English. Questions are welcome in either French or English. The workshops are free, however, we will be collecting donations in support of the Ottawa Caring and Sharing Exchange, a local charity that provides schools supplies to children in need (see http://www.caringandsharing.ca/index.php/en/about-us.html).